Defrost shrimp meat, wash under running water, remove gut-vein (if it is not removed) discard in a colander to drain. Put deep pan on strong heat, add shrimps and cook for 10-15 min, constantly stirring, evaporate excess liquid. Cut mushrooms in thin strips and put in pan to shrimps, reduce heat. Add grated ginger and sauce Sukiyaki. Stir it, reduce heat to minimum and cook for 10 min. Meanwhile, pour in a big saucepan 2 l of water and bring to a boil, put in boiling water noodles for 4-5 min (not more), stir it. Fold ready noodles in collander, then add to shrimps, stir it, stew for another 2-3 min. Before serving sprinkle with green onion. 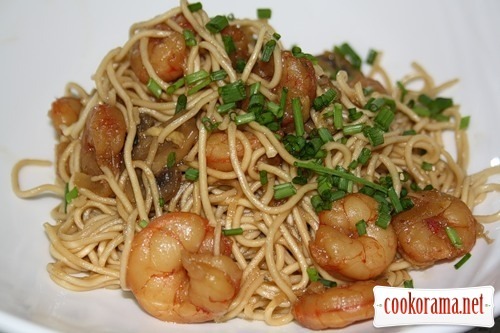 Top of recipe "Egg noodles with shrimps and mushrooms"